There's no doubt it's tricky at times being into genealogy. There's the ethics of using other people's information (yes, we all know you shouldn't just copy stuff without appropriate attribution, except for YOU Gen Y and whoever those weirdos are from other age groups who think it's ok to use other people's stuff without so much as a 'sourced from cousin Fred' or, even worse, pass it off as their own), there's the ethics of whether or not to share particular discoveries (something I'll be revisiting in a later blog), the ethics of handling living people's information etc. etc. The list goes on! 1) Who actually should have the item in the first place? I've previously mentioned the case of the Family Bible in my blog, because of its significance to my own personal genealogical journey. It was given to my great-grandparents, William Evans and Florence Gough for their wedding in 1888. Since then it has belonged to my great-aunt Mabel, my grandmother Gwen, my mum, and now me. Mabel was the oldest in the family, but she used to let her kids play with it (hence its broken spine and loose pages). Apart from us all being female there is no 'pattern' to who has received it since. My grandmother decided to get it from Mabel for my mum, and mum decided I should have it as she knows how much it means to me and felt it would be most valued in my home. However, I have numerous cousins who have just as much 'right' to it as I do. And they can prise it from my cold, dead hands, 'cause I am not parting with this baby! As a subset of that, when two people have equal 'right', who decides what should happen and how? My great-grandfather had medals from WW1. Grandma thought she had them and had given them to my father, but mum swears black and blue that never happened. Anyhoo, another relative has been looking for them. I made the point that perhaps one of Grandma's sister's children has them. Well, said relative launched into a rant about how, if that has happened, we should just demand them back. Um... why? What makes them more 'ours' than 'theirs'? I'd love to find out if they do have the medals for general interest, and so I can get a photo of them, but if they have the medals I don't see there is a damn thing we can (or ought) do about it claiming them. 2) When you own the item, what criteria do you use to work out who to pass it on to next? In our family we are lucky to have two sets of war medals. One belonged to my husband's grandfather, Mervyn Sykes. He served in WW2. They are beaten up looking as Merv was very into the RSL so routinely had them out for occasions. He was also a total pisshead so he was none too careful on said occasions. Hubby always said they were to go to our son 'because he was a boy'. Not because he was the eldest, not because he was interested (he's only 4!) but because he's a boy. Setting aside my feminist inclination to scream "Dude! What the actual even? ", it is on reflection the way hubby received them. His father got them because he was the boy in a family full of girls. At least, as Francis Fulford identified when discussing primogeniture in The F***ing Fulfords, it's consistent. And thankfully we have two sets of medals, because we also have two boys, as much as I'd have loved to watch hubby's head implode trying to work out which should get the one set. Medals awarded to Ron McPherson in WW2 - in pristine condition, because he never came home from El Alamein. I haven't made up my mind yet about how I'll pass on the items I have. Thankfully being a (relatively) youthful type, it's not something I am statistically likely to consider for a bit just yet. I think I'll wait and see whether the kids are interested, their partners are interested, their kids are interested, what the nieces would value, other cousins etc. Mainly I'll be looking to pass them on to the people I think will treasure them the most and ensure they are shared and passed on, regardless of their degree or type of relationship. 3) In what ways do you share the item with others? 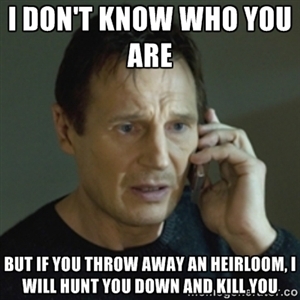 Of course then there's the whole dilemma of what one ought to do if there was a divorce in the family, what you should do if you find a prized possession that doesn't belong to your family (we all know you use resources like Rootsweb mailing lists to track a rightful owner if you can, right?) and who knows what other scenarios. At least we can all agree on one thing! Am enjoying reading your blog and have pondered this heirloom question many times myself. Writing my blog has helped me identify various members of the family who have interests (and memorabilia) in the family history. Hopefully some will maintain that interest and be worthy recipients of handing it down to. I'm a 'sharer' too and it's so annoying when you know an aunt or a cousin has something precious to the family and won't even send a photo, let alone let you see it!